BAJAJ BRUSH DELINTER is designed specially for cottonseed breeding & black cottonseed producing industry. This machine is a gentle delinter which can remove up to 80 to 90% of the linter available on the cottonseed. Delinters are built to give maximum quality and quantity of lint with minimum power consumption .It is specially designed by our expert team of engineers, designers and craftsmen for durability , reliability, smooth and noiseless running, the consumption of electricity is very low in compare to other brands. With an objective to fulfill the demands of our clients, we are engaged in manufacturing a wide array of Cotton Seed Delinting Machine. We are highly acknowledged organization engaged in presenting remarkable range of Cotton Seeds Delinting Machine. 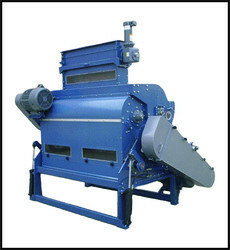 Cotton Seed Processing plant consists of a number of processing machines such as seed cleaner, Decorticator/Huller, Hull & Seed Seperator, Hull Beater, Centrifugal Fans, Cyclones and Conveyors. SEPL can supply on turn-key basis CSP of capacity 50 TPD to 200 TPD at very economical prices. SEPL team has major experience in executing CSP projects to West and South Africa. : • By the help of De-linting machine cotton fibres which are on the cotton seed are separated from the cotton seed before it goes for crushing. 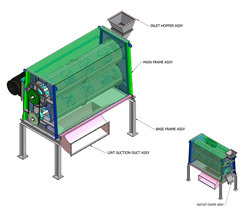 This process is called cotton linters second cut in which fibres are of different types. - Complete sets of machinery for 400 MTD capacity of cottonseed De-linting& De-hulling byCottor Plant (I) Ltd. in technical collaboration with Cantrell Worldwide Inc Dallas, Texas, U.S.A.
We take pleasure to introduce ourselves as one of the renowned firms for providing the best-in-class range of Cotton Seed Delinting Machine.